Recently, I had a client who currently lives in the Cordes area of San Carlos email me and ask why Cordes seems to be lacking the same resale value as the Howard Park and White Oaks areas of San Carlos. It’s a good question. First, for those of you who are not sure where the Cordes area of San Carlos is located, it is essentially the following: north and east of San Carlos Avenue, west of El Camino, south of Belmont. Please keep in mind two additional statistics when viewing the above numbers: (1) the average sales price of a home in White Oaks over the last six months was only $836,000 (an indication that the market was mostly comprised of smaller homes); and (2) the average square footage of the homes in Clearfield Park was only 1,205 square feet. The reason that I mention both of these statistics is because the lower the square footage, the higher the price per square foot in most situations where the lot value is worth more than the house itself. Let’s take a closer look at Cordes. Cordes is the oldest residential area in San Carlos. It is the site of the oldest home ever built in San Carlos, that being the old Arguello Adobe which is believed to be the present day location of Cedar and Magnolia. In the early 1930s, Cordes was given the term “Poverty Hill” by San Carlos residents. Poverty Hill was a reference to all of the half built homes in the hills that were stalled by the Great Depression. Cordes is also home to Nicholas Smith’s Pagoda House on Chestnut Street, a private retreat that was built for the old Hudson River Steam Boat Captain in the mid 1800’s. This home still stands today. Additionally, many homes in Cordes have the architectural detail that is missing in the majority of San Carlos homes built after World War II. Finally, half of the Cordes area is very close to the north end of Laurel Street, which is a major factor with buyers choosing Howard Park and White Oaks. Rich in history, close to downtown, with highly ranked schools and three neighborhood parks, Cordes deserves more attention from buyers. So, why isn’t it happening? This is actually a very tough question to answer because there is not a clear-cut response from buyers. Based on the feedback that I get from buyers and people writing in on the blog, I believe I can shed some light on the matter in terms of the most frequent responses. The most popular response seems to center around north of San Carlos Avenue perhaps feeling more like Belmont than San Carlos. Not that there is anything at all wrong with Belmont, but buyers seem to draw a distinction between the feel of the San Carlos flatlands, the San Carlos hills centering around Brittan and Melendy, and the feel of north of San Carlos avenue. The second most popular answer centers around the age of the homes in Cordes. Combine the age of some of the homes with the frequent hillside or sloped lot location, and it will make some buyers pause. Finally, some buyers feel that the lack of sidewalks in the majority of Cordes is an issue. My personal feeling on Cordes is that it is the only area on a price per square foot basis and an average sales price basis that is out of whack with where it should be ranking in relation to the other areas of San Carlos. Cordes neighborhoods have character and a tremendous amount of pride. I have had an opportunity to speak with many families currently living in Cordes and many believe their neighborhood is the best kept secret in San Carlos. They may very well be correct. One of the things that I always tell my buyers is that number crunching and analysis is an important part of buying a home and looking at re-sale. However, when deciding to focus on a particular area of San Carlos it may not be a bad idea to get the real story from the people who actually live there. You may be surprised by what they have to say. Cordes Area: I have lived in this area for over 40 years and love it. Our lots are huge and the housing is spaced. Although it is not the San Carlos Hills or White Oaks area, we are known for our gardens and good neighbors. We arfe only a ten minute walk away from downtown and public transportation. My home has been in the family for 60 years and we also own a home above Argeullo Park for 50 years. It is sad that people just buy homes for resale value instead of buying a piece of God’s country. Yes our homes may lack the detail of some mini mansions around San Carlos but our homes do have charm! Good article Bob. 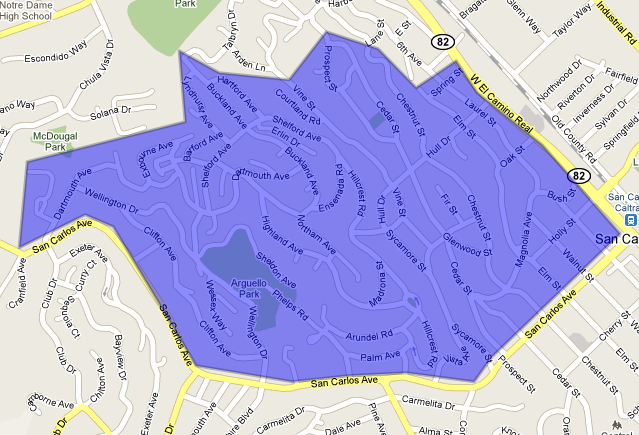 I also wondered why Cordes is lagging some of the other areas in San Carlos on a price per square foot standpoint. While all the schools are great in San Carlos, Cordes has Arundel and Tierra Linda which both had the highest API scores amongst the elementary and middle schools. Also, I believe the bulk of the Cordes falls into Carlmont which is also one of the highest rated high schools between San Mateo and Menlo Park. I see the proximity to Belmont as a great benefit. Access to Carlmont Shoping Center and the Belmont library to name a few of the “hidden” benefits. All in all, a great place to live with my only knock being the lack of sidewalks. Great post. I grew up in the Cordes area and think it is extrememly under-rated. All the schools are within walking distance, very little traffic, and walkable access to Arguello Park. It is one of the hidden gems of San Carlos. I had no idea. I grew up in this area and it’s fantastic. very quiet, some really great parks for walking or to take your dogs, the houses are larger than some of the post ww2 houses in the flats, (many of those started out as 2 bedroom 1 bath, with tiny lots). Some of the lots in Cordes are 1/8 of an acre, which is enormous for San Carlos. but I do think that the lack of sidewalks scare parents with younger children, so the neighborhoods have very few children (although more and more are moving in). I think the best part about the houses are they are quirky. some have 1/2 closets, odd shaped rooms, closets that extend 6 feet beyond the door, and split levels, which break the boredom of cookie cutter houses. all I know is, that living here is like stepping back in time, where neighbors know you, people wave hello and ask how you are, pick up your trash cans if they get knocked over, and just all around keep an eye on each other. In 20 years myself and neighbors have never had a break in to cars, or houses, (even though i forget to lock my car more often than I like to admit).